Staffordshire based waste management company, Red Industries, has expanded and strengthened their position as one of the UK’s leading independent waste businesses with the acquisition of competitor, West Midland based Environmental Resource Group (ERG), in a transaction which Sheffield based specialist Corporate Finance Firm, Castle Square Corporate Finance, acted as the Lead Adviser. BGF, the UK’s most active investor in growing businesses, invested £14m into Red Industries, taking a minority stake alongside Adam Share and the management team, while HSBC provided £25m in loans and working capital facilities, together with funding the acquisition and providing additional growth and working capital. Sheffield based lawyers, Wake Smith, led by Director John Baddeley provided legal support and advice to Red on the acquisition and fundraising. Red was formed in 2006 by CEO Adam Share and operates from 3 locations in Stoke-on-Trent and Newcastle-under-Lyme and provides clients with total waste management, waste consultancy, hazardous waste management, and secure destruction of waste services, alongside sample and testing analysis and technical support. Red had grown rapidly through organic growth supplemented with strategic acquisitions including the acquisition of Tarmac’s landfill business in late 2016. The acquisition of ERG is the cornerstone of the ongoing expansion strategy supported by BGF and HSBC. The acquisition strengthens Red’s position in the marketplace - broadening Red Industries’ customer reach and service offering, adding additional waste management facilities, a larger client support team, and the fleet of bespoke vehicles. ERG will benefit from Red’s market-leading operations, significant processing capability and highly experienced client service platform. 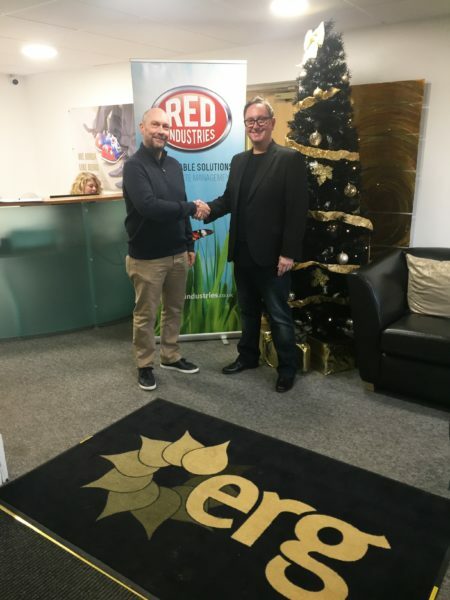 ERG, which encompasses brands such as Envirosol and Chemtech, will continue to operate as a wholly owned subsidiary under the branding of the Red Group. The combined group has an annualised turnover of £31m and creates a platform with the critical mass on which to build through further through organic growth and strategic acquisitions. Sheffield based dealmakers; Castle Square Corporate Finance provided corporate finance advice to the management team, leading negotiations on the acquisition of ERG, and also acting as Lead Advisor on the fundraising process, to find both equity and debt to fund the transaction, and also provide additional funding to support Red in its future strategy. Castle Square is a mid-market specialist corporate finance boutique with a proven track record in working with management teams to agree on acquisition terms with targets involved in a buy and build strategy and deliver the necessary funding via debt and equity markets. Directors Kevan Shaw and Steve Bell from the Castle Square Team led on the deal, running a structured process which resulted in the Midlands-team at BGF, led by Aaron Baker and Gurinder Sunner, chosen as preferred equity backer and Red’s existing bankers HSBC providing the necessary debt finance to complete the transaction. Kevan Shaw added, “Having assisted Adam and the team at Red buy-out some former shareholders in 2015, and then acquire the landfill business from Tarmac in 2016, I am delighted that Castle Square has been able to deliver what is a game-changing transaction for Red. The combined group now has significant critical mass from which to execute its strategy to create the largest privately owned group in the sector”. HSBC’s Sheffield based Chris Alsop led the team, who provided the debt part of the acquisition finance alongside working capital facilities. HSBC was advised on the legal aspects of the transaction by James Burdekin and Paul Trudgill at Keebles LLP. John Baddeley added, "Wake Smith are delighted to have been involved in Red Industries' latest acquisition which doubles the size of Red and allows the company to move into a different league. It now becomes one of the largest independent waste disposal companies in the UK." The Transaction Service team at Dow Schofield Watts, Led by Partner Rob McCarthy performed financial due diligence services for Red Industries, BGF and HSBC.